Is this Star Wars 9 John Boyega Instagram post telling us something new? It’s easy to forget that, yes, Star Wars 9 is out in 2019. 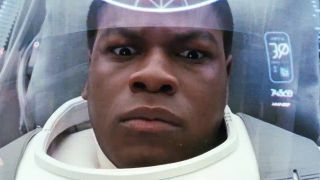 John Boyega is doing his level best to keep up the hype, though, by posting a cryptic Instagram post about his character, Finn. Not only does it tease something dramatic going down, Boyega also promises something “visually crazy” which, if you’re talking about action from a galaxy far, far away, is bound to be something utterly ridiculous. Ooh, what a teaser. If you think back to battles and epic moments of Star Wars past – say the Death Star run or, more recently, the visually striking battle on Scarif in Star Wars: The Last Jedi – they’ve all pushed the envelope just about as far as the can go. If Boyega’s hints are any indication, Star Wars 9 might just top the lot. But what’s it going to be? The hands must mean something, after all. Could it be an unlikely rematch of Finn vs. Phasma: Part 3? Or maybe Finn finally gets his hands on another lightsaber and fights side-by-side with Rey in the lightsaber battle to end all lightsaber battles? Either way, I don’t think Finn – or anyone else, for that matter – is going to come out the other side of Star Wars 9 the same person. John Boyega’s Instagram post has done the job of getting us fully hyped and, unfortunately, fully prepared for what may be a dark trilogy-closer. If Star Wars 9 isn't top of your list of upcoming movies in 2019 then it's about to be nearing the summit very, very soon.